Billed as a Music Experience as opposed to, I suppose a music Festival, it's an event that provides an opportunity to visit the historic site of the Quarantine Station situated at the tip of the Mornington Peninsula. And to listen to some of the acts appearing in Australia for the Byron Bay Blues fest which has now branched out to Tasmania and Western Australia. Accessible by ferry from the western side of the Port Phillip Bay, just don't expect to return the same day if you want to see the headliners appearing in evening sessions. As a music experience it definitely had the feel of a music festival, being outdoors and in daylight but what really had my thoughts returning to the glory decade of sixties and seventies music festival was hearing that hoary old prog rock chestnut Stairway to Heaven even if it was an instrumental version. Even more frightening was the youthful audience singing the words to Pink Floyd's Wish You Were Here. Fortunately this musical travesty didn't present itself until later in the day. 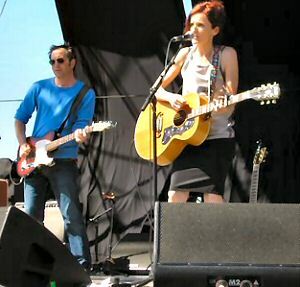 Kicking off proceedings earlier in the day was Austin Texas native singer songwriter Patty Griffin. Perhaps it was the heat of the day or the early time or that she was unknown to those that listen to Australian radio of the commercial kind but the well spaced out crowd allowed easy access to the front of the stage a prime position. The smooth sound provided by Griffin and her band was a perfect fit with the location beside the water and the glorious autumn weather. The songs of Griffin and sympathetic instrumentation by her band were a triumph in understatement. Her songs featured soaring vocals, funked up grooves and slow burns. There was the whimsical Making Pies, It Don't Come Easy, Top of the World, Up to the Mountain before finishing with album title track 1000 Kisses sung in perfect Spanish. Griffin's short set was the perfect entrée to what was shaping to be an excellent day with Griffin's gracious mention how excited she was to be sharing a stage with the next act up, Mavis Staples. 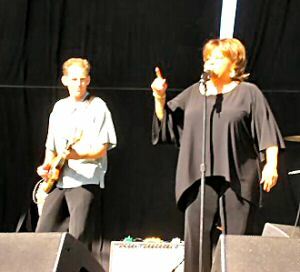 Mavis Staples, a member of famed gospel and civil rights group the Staple Singers lead by the legendary Pops Staples. Mavis, was introduced as having walked arm in arm with Doctor Martin Luther King. First song - sixties Buffalo Springfield anthem For What Its Worth - set the tone and probably activated some of the Hits and Memories crowd in the audience. There was no respite with Eyes on the Prize kicking the mood up a gear but next up Pops song Down in Mississippi was a direct confrontation to past sins of repression and injustice. Perhaps in tribute to the hot white boy band backing Miss Staples it was into one of the greatest iconoclastic bands of the sixties The Band and The Weight which had pure Gold FM overtones. Mavis's band was balanced by the African American harmony trio - two women and a man. It was about this time that Staples decided to take a powder - the powerful afternoon sun taking its toll as it set due west of the stage and directly into the performers eyes. It could have been the need to apply sunscreen or block - depending on which country you come from - or it might have been just a change of shoes. On Mavis's return after an impromptu instrumental jam she became a barefoot preacher. This was fitting as another Pops song Why Do You Treat Me So Bad, segueing into a rousing March Every Day and Respect Yourself while saving the best for last with the show stopper Take You Down getting the audience involved in a sing-along. It was only appropriate but mainly unnoticed that during the performance a yacht had been motoring around the nearby moored flotilla flying the national flag of Tibet from the mast. There was no indication that once noticed it had been driven out of the temple by the money-changers. Punk rockers turned crossover flamenco guitar players Gabriella y Rodriguez played an entirely instrumental set that was immensely popular with a younger crowd who decided to storm the front of the stage and indulge in a little binge drinking of ready to imbibe beverages. This was much to the regret of dedicated fans who staked claims for the headlining acts due up later in the day. The performance was totally without any colour or shade and appeared to be merely an exercise in technical ability. This extended to a total overloading of the amplification to the point where it was feared that permanent damage might have been inflicted through percussive clipping to the speaker system. Obviously having graduated from the busking circuit the duo should try to expand their repertoire from the familiar fodder of me-too Rock station songs such as Stairway to Heaven. The encore was noteworthy for all the wrong reasons with the cringe factor overloading during their rendition of Wish You Were Here that was sung with much gusto by the audience but not the artists themselves. Maybe they should try to connect to their audience a little more by singing some Conjunto, maybe a Ranchero, Cumbria or even a little Norteno. Another tip, wearing a Collingwood cap on stage will only endear you to 1/16th of audience. It is hoped that it was only a last minute wardrobe addition to ward off the setting sun. Billed as his only Victorian appearance it was apparent from early in the day that Urban was one of the acts that fans had come to see. This was evidenced by the growing crowd in the mosh pit close to the front of the stage. Appearing just on dusk when the stage lights could really take effect it was a highly charged performance from the get go - especially the full frontal guitar onslaught from opening road song Where the Black Top Ends. Urban looked comfortable in the setting moving around through the band and getting a feel for the audience. While exhibiting a rock edge in the sound there were still connection to the country roots through mandolin, banjo and the familiar tall figure of ex Ranch band member Jerry Flowers on bass guitar. Urban is a master of the power ballad with songs from the album Be Here before switching to acoustic solo guitar for Nu Country TV video hit Raining on Sunday from Golden Days. It was at this point that the penny dropped with the realisation that the majority of the generation x and y audience while knowing the words to mouldy oldies didn't have a clue about the words to songs in the Urban catalogue. This is an indictment of the powers that control commercial radio in this land that one of the biggest artists with some of the biggest hits in the US has been an unknown musical quantity to the majority of people in this country. The band returned to the stage and launched into Stupid Boy from the latest album and Better Life. Urban clearly enjoying himself and feeding off the warm audience response was modifying the set list with the cover version of Steve Miller's The Joker. This version saw all band members given the opportunity to share the limelight by singing a verse each in turn a gesture by Urban exemplifying his generosity and enjoyment of the moment. You're My Better Half, Making Memories of Us and Days Go By represented a trilogy of songs with deep and heartfelt meanings. The guitar techs were working overtime with guitar changes on nearly every song in the set. 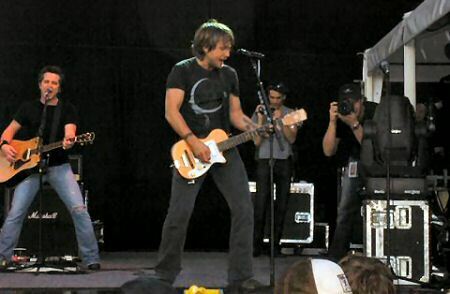 The comic relief for the set was provided when Urban, responding to a female fan's declaration that she had a Keith Urban tattoo on her body, invited her onto stage so that it could be visualised. The lass - a native of New York - was clearly stage struck but the binoculars that I almost didn't need because of my proximity to the stage came in very handy and the tattoo was revealed to be placed on the inner thigh. Another #1 U.S, hit Love Somebody Like You provided a rousing unifying singalong for the crowd and the final song of the set as Urban bade farewell and genuinely thanked the audience for the response and admitted that he wasn't sure what to expect when he took the gig. It was clear that Urban's star is still rising in the unlucky radio country and who knows even the commercials might pick him up. There has been no lack of radio airplay for John Fogerty over the years - at least not the back catalogue of Credence Clearwater Revival. Having something like 10 #1 hits in the early 70's CCR songs have been on high rotation on Hits and Mausoleum stations for years. They were well known to the audience on this night. This unfortunately caused some angst as nearby fans decided to sing chorus and verse themselves rather than enjoy the artist and writer of such popular songs singing them. 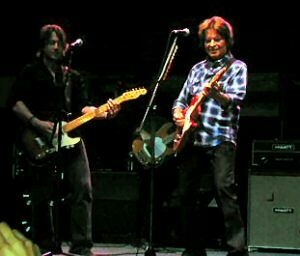 Big hits and terrific songs, Travelling Band, Bad Moon Arising and Green River opened the set before Fogarty invited Keith Urban onto the stage. Stools were produced and armed with acoustic guitars Fogerty and Urban sang Broken Down Cowboy with Fogerty giving some advice about the importance of being happily married to a good woman to his live audience with a clear reference to Urban's celebrated marital union. The jams were kicked off with duelling telecasters between Urban and Fogarty for an audience-rousing version of Cottonfields. The stylised and hackneyed song collided with the audience's clear perception and innate prejudices of country music while completing missing the interplay of the guitars with their top paddock riffs and bender indulgences. After bidding Urban farewell the hits kept on coming with Looking out My Backdoor, Born on a Bayou, Down on the Corner, Boogaloo (Down the Road) and Midnight Special. The meaning of the last song about prisoners believing that they can escape their incarceration when the train rolls through their cell lost completely on the audience. Not lost on this reviewer was the Kurzweil piano up on stage that had been shared by all artists throughout the day. The pace never let up for the 62 year old Fogerty. More hits and memories were Have You ever Seen the Rain? Rocking All Over the World, Run Through the Jungle and the Old Man Down the Road. It was all Gold, Gold, Gold. Missing were songs from the album Blue Ridge Rangers where Fogerty played tribute to country greats like Luke the Drifter with a great version of Jambalaya and that song of lost hope and disappointment, Lodi. It was prudent at this stage to bid adieu to performers for personal safety reasons and expedience as the exit required a bus ride out but not through Selma, Alabama. It was onwards and upwards into the night before embarking on another voyage of discovery the next day Sunday but not the acts rostered at the Point Nepean Music Festival, I mean Experience. PETER O'KEEFE was the host of Lubbock Or Leave It on Nu Country FM during its halcyon days and keeps the flame burning for the music as membership officer of Nu Country TV for more than a decade.